An atomizer is nothing more than a coil of resistive wire (wrapped around a wick) that when electricity is passed through it, it heats up (exactly like a toaster or light bulb). When the liquid touches the heated coil, instead of evaporating, it vaporizes. This creates a vapor that you can see, taste and smell. It also can carry nicotine. The thing is, while the atomizer is as simple as this, how you get the liquid to the atomizer, and then the vapor to your mouth, is much more complicated. This is why there have been (and will be) so many different types of atomizing devices (simply called atomizers). Understand that EVERY type of vaping atomizer has some sort of coil and some sort of wick involved. The most important part of your vaping experience comes from the type of atomizer device that you choose. There is NOT a perfect system. If there were, we would only talk about that, but since there are pros and cons for each, we feel that you should know a little about what’s available as we take you though a bit of an atomizer history lesson. This was the original system that came with the eGo. It has since been replace by better methods and therefore sort of “old fashioned” in the vaping world. You can still buy these, and many eGo kits still come with it, but it’s not really recommended. 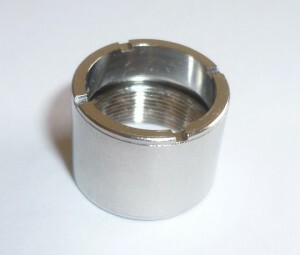 The reasons for this are mostly due to it’s design, namely, the liquid doesn’t like to wick into the atomizer properly. There are two parts to this, the atomizer, and the cartridge (duh). 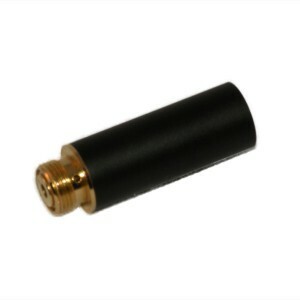 The atomizer is the part the has the coil that vaporizes the liquid. It is a coil of resistive wire that acts like a toaster by heating up. 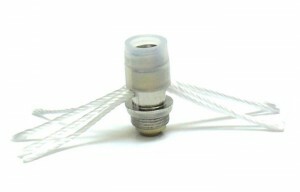 The cartridge is a simple plastic piece filled with “poly-fill.” A cotton-like substance that traps the juice inside and touches the coil in the atomizer. 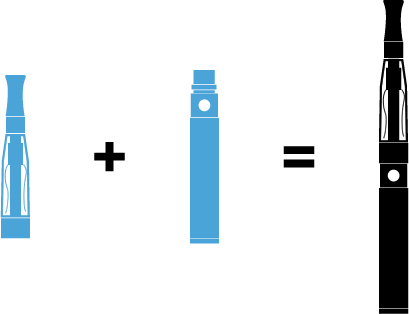 You just remove the cartridge and drip your liquid (Vaping Fuel, obviously) into it until the poly-fill is fully saturated. Simple enough. Someone brilliantly came up with the idea to combine the two items above to create what is called a cartomizer (Cartridge + Atomizer). This solved the number one problem of the cartridge because now, the liquid is always touching the coil. They are also simple to refill. These are still used and sold to this day. They come in 5-packs and last awhile (depending on the type of flavor you use and how often you use it, you know it’s ready to replace when they become hard to draw though and the liquid starts tasting not-good). Like the cartridge method above, this suffers from the same issue where you can really only put one flavor in each cartomizer unless you want the flavors to mix. There are three main methods that we know of. Dripping it straight in, using a syringe, or the “condom” fill method (see video). I prefer the syringe as it is the fastest, cleanest and easiest way for me personally. You can take a used cartomizer and boil it in a pot of hot water for 15 minutes. This will clean out any liquid that is caught in the filler, but it doesn’t do a fantastic job of removing built-up gunk on the coil. This can extend the life of the cartomizer a little. 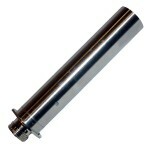 We recommend Boge Low Resistance 510 Cartomizers. 510 = the thread pattern. There are several types of threads (801, 302, 306 etc) in the e-cig world, but the eGo uses the 510, so don’t you forget it. Since cartomizers overtook the separate cartridge+atomizer systems, the next problem to overcome was the amount of liquid that a cartomizer would hold. Someone figured out that if you punched a hole in the side of a cartomizer and attached a tank to the outside, you could keep the cartomizer filled and it would then hold 2x-6x more liquid. 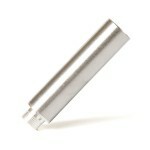 In addition, they tossed in a second atomizer coil creating a “dual coil” cartomizer. This, plus the tank is how you get the “Dual Coil Tank” or DCT. For the most part, these are all dual coils but even the single-coil versions are usually referred to a DCT just because of where it originated. Specialized cartomizer for DCT. Notice the base and hole punched in the side. In order for the tank to stay where it should on the cartomizer, it was figured out that a small base should be added to the bottom. This keeps the tank from sliding around. For those people that didn’t care for the dual coil cartomizers, they would punch their own holes in the side of standard single coil cartomizers and still use the tank to carry around more liquid. One problem with the DCT is that because of its size, you can no longer use the trim cone that came with the eGo-style batteries to finish off the look. This left an unsightly gap where the large outer threads were exposed. So someone invented a simple solution. A little threaded ring that would both hide the ugly threads as well as give extra support to the tank. The end result is that you can have a cartomizer, a much larger amount of liquid and still have a sweet-looking vape. Photos from myvertict.net. Head over there to read his review. This can be simple, or annoying depending on if it’s done right. First you have to fill the cartomizer as you would normally (see instructions above) making sure that the tank is seated properly. Then you have to slide the tank up, just high enough so that you can gain access to it without sliding it up too high. This is where a syringe can come in handy. If you have one, you just poke your needle into the tank between the opening of the tank and the side of the cartomizer and squirt away, without a syringe, well, good luck getting the liquid in there without spilling any. Once filled, just slide the tanks back down to the base and draw a few times to make sure that it’s feeding into the cartomizer properly. This is the next step beyond the cartomizer. 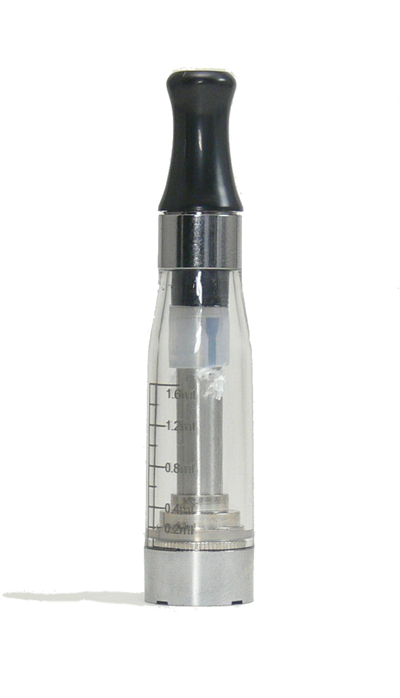 They call it a CLEAR-omizer because they usually are made of clear plastic (available in many colors) instead of stainless steel (although, they DO make them in stainless as well). 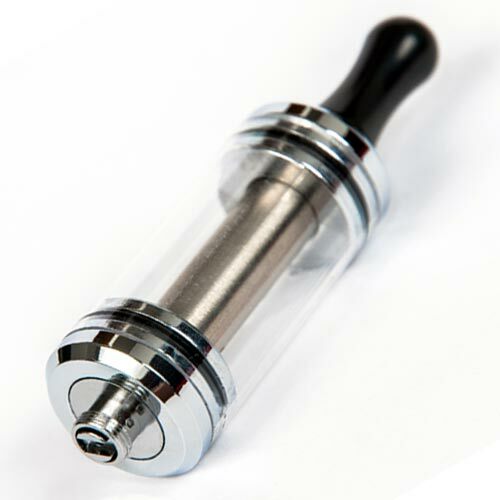 The clearomizer is very much like the cartomizer in the way that it is a combination of the atomizer as well as a way to hold the liquid. 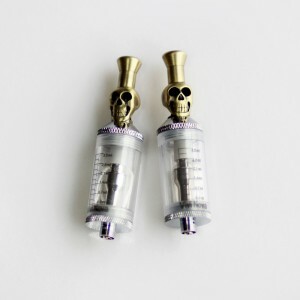 Unlike the cartomizer, the clearomizer does not use a poly-fill to hold its liquid, but rather the cylinder itself serves as a mini tank and it is fed to the atomizer via a wick. 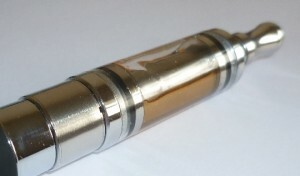 The CE2 has the atomizer coil on the top, and the CE3 has the coil on the bottom. Both of these styles are shaped more like over-sized cartomizers and usually don’t work with your regular eGo cone since they are a little wider in diameter. There are advantages to each, such as having the coil on the top will allow you to “dry burn” it and get the built-up gunk off of your coil, thus extending the life of your clearomizer. The CE4 and CE5 are shaped differently than their predecessors. Usually they include a built-in mouthpiece or a spot for a regular 510 drip tip. We THINK that the CE stands for “Clearomizer Edition” but we may have just made that up. The drawback of the clearomizer is that the liquid doesn’t always wick properly (which seems to be the problem with nearly all alternatives to the cartomizer). When it works, it works great. When it doesn’t, it is disgusting. The other issue (it may not be an issue to you, as it is not for myself) is that you must use a syringe to fill it (CE2 & CE3 styles). This filling method is pretty much the same for the CE2, CE3. You’ll find some CE4 and & CE5 sometimes will have “built in” drip tips that you can just pull out or un-screw and you can just drip the liquid right in with little effort. To clean a clearomizer, it involves cleaning out the old liquid, and then burning off the excess build-up on the coil. The lengthy video below shows how to do this (for a CE2 style). Don’t worry about using the crazy syringe/flusher that he uses to get the liquid out, you can just run it under water a few times. Once the vaping community moved more toward clearomizers from cartomizers the evolution continued. Thus, the rebuildable tank systems were born. Don’t ask me why they decided to stop calling it a clearomizer and changed the name to a “tank” because other than its shape, it’s practically the same thing. The term “Carto-Tank” has also been used for this type of device. The problem to overcome was the fact that clearomizers were disposable and cost too much to replace constantly at $5 each. Also, it was a lot of waste. Someone took the idea of a clearomizer and made it modular. This meant that after the initial purchase of the unit, one only needed to continue to buy the replaceable atomizer heads which are pretty cheap at around $2 each. 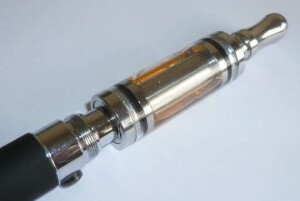 The inherent problem with this design is that the coil is at the top of the tank which then required the wicks to become super long to reach the bottom of the tank. This is a great idea if it worked properly. Some might say that it DOES work right, but in my experience, I needed to keep the unit 1/2 full at all times or tilt my whole vape sideways while vaping to keep the flavor where it should be. What’s more, is that you can disassemble the entire unit for cleaning. This is a key feature over the clearomizer, the those would require some sort of flushing device, or inefficient method of trying to wash out the old liquid to keep it clean. The idea of this is awesome. 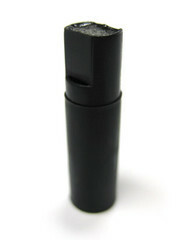 The replacement atomizers are cheap and readily available. Many companies started creating their own atomizers that were compatible with each other so if you liked a certain brand tank, but another brand atomizer head, you were all set. Another great thing about this type of tank is that most of them had a top cap that has an opening for a standard 510 drip tip. They usually came with their own cheap plastic one, but you could always toss on your coolest tip for some element of customization. Don’t stop your education now, choose something below and keep learning.